Firewall: Zero Hour released today, August 28, 2018; it’s a first-person shooter for PlayStation VR that centers on collaborative online play. You’ll be thrust into 4-on-4 tactical matches, although the game can be played alone via the training mode. While the game can be played with the Dualshock 4, the game offers PS Aim controller support and is best played with that peripheral. With this in mind, fans on PS VR Reddit have been flooding the page with their PS Aim controller modifications. While these PS Aim mods have been happening since the peripheral released, the influx of posts speaks to the hype surrounding the release of Firewall: Zero Hour. 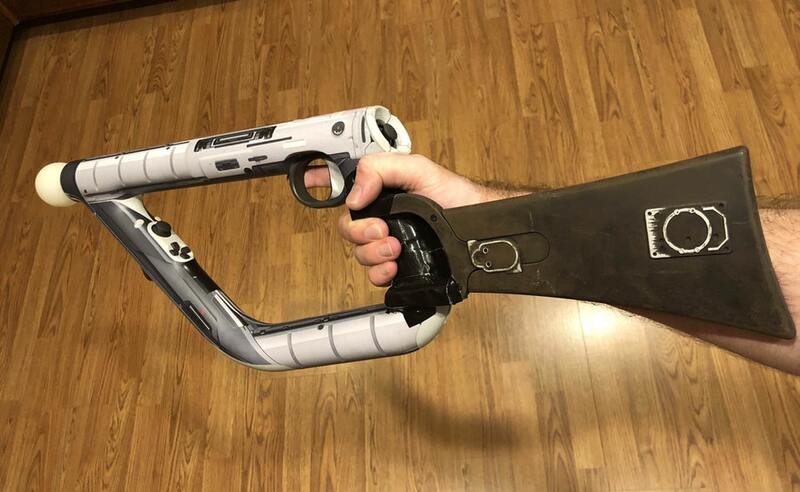 Fans are sharing everything from 3D-printed mods that make the controller look more gunlike, to canes duct-taped on to increase comfort. Extending the Aim controller seems to be the most popular mod, with fans adding PVC and styrofoam in some cases. It’ll be interesting to see the impact this excitement will have, now that the game has been released. For more details on Firewall: Zero Hour‘s gameplay be sure to check out our hands-on preview. Remember that the game requires an internet connection to play, regardless of the mode you select. Firewall: Zero Hour is available now for PlayStation VR for $39.99.